After a couple of weeks of scraping by with only fifteen players and a makeshift front row, it was great to see the Cru field a strong squad. There was a full compliment of front rowers including new recruit Yute making his debut. Olivers, leaders of division one, promised to provide us with more serious opposition than from our previous two heavy wins in the Shuto League. There was a clear impression that we were not being taken seriously judging by the amount of giggling coming from the opposition before the game and during the first half. A well worked early try by Gene showed our intention to play rugby and win. From the off the Cru looked like the more motivated and dominant side. Forward play moved up a level from previous games with solid set pieces and tighter driving play. The forwards showed their ability to play to a game plan and exerted more control at the rucks. This platform allowed the backs to continue their great attacking form. Defense was solid with better communication and some big hits from Tom and Pat. This was let down occasionally by the Cru’s inability to retreat ten meters for penalties. Olivers’ kicking options were limited by the threat of Yorkie at full back who always looked dangerous returning the ball. Strong running from some of our big boys and tighter support at the breakdown set the platform for the backs to continue making ground and cutting holes in the opposition defense. 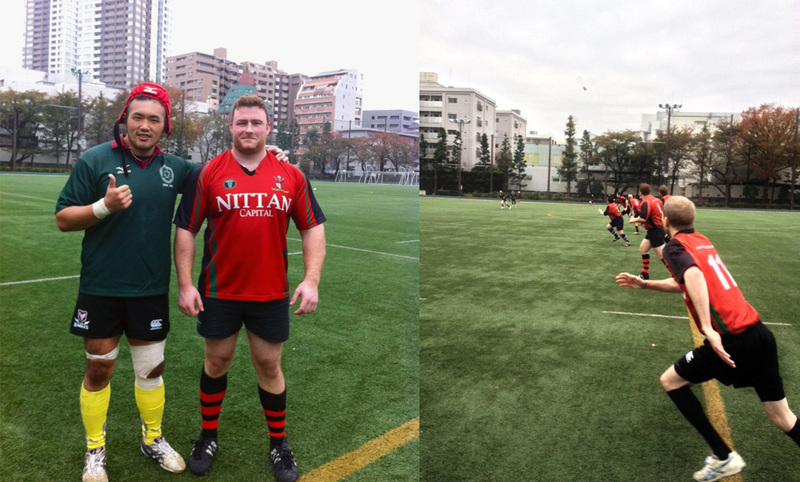 Two more tries from Ryuji and Sean Gibson were converted by Evan to give us the lead at the end of the half. Discipline, which had been tight, was let down by a yellow card to Richard just before half time after taking the captain’s advice of “smack the c@#t” a bit too literally following a consultation on how to deal with constant holding at the scrums. Some enthusiastic bashing to get free followed by a body blow probably wasn’t the cleverest response right in front of the ref. By the second half the giggling had subsided. The last notable giggle being heard from the number eight just before Tom plowed him into the astroturf. The Cru maintained their rhythm after a number of halftime changes. Marcus returning to the pitch from wing to flanker seemed to return all of the kick offs making yards. More Cru pressure led to Yorkie running in the first try of the second half. Pat, who had risked his future chances of fatherhood, by squeezing into his pre-game warm up shorts had recovered well enough for a barnstorming run down the right flank to score our fifth try. With a slight mismatch of physiques he opted for the direct route through the opposition winger who might have regretted his decision to go high. Another try from Tom and then from man of the match Evan, who had one of his quietest games cussing-wise but put in a strong performance at scrum half. He ran in the final Cru try with a blistering run down the wing. He also had a strong game with the boot kicking five out of seven conversions. Olivers started coming back into the game in the last quarter. A try saving (apparently legal) shoulder charge saved a certain try and maintained a two score lead. Steady heads at half back allowed us to close the game down and keep out more scores finishing the game 45 – 33. Tooley continued his great work by organizing the after-game nomihoudai at our local Doma Doma where a good turnout had of a couple of hours of quiet drinking and sophisticated conversation. With regular games and post-match drinks there is a strong club feeling this season. Greater commitment is showing with even Travis now turning up to matches sober. With still a lot of room for improvement we are moving in the right direction. It won’t be long before a fixture with the Cru is one to be taken seriously.